Since my daughter is the only child I’ve ever really been around for any length of time, I really have nothing else to compare to in terms of development. People often comment though on my two-year-old’s language development. Other parents, teachers and people who have way more experience with kids than I do. Recently a friend of mine asked if I did anything ‘’special’’ to teach our daughter how to speak ‘’so well’’. Given that this is my first go-round with this parenting thing, my answer is always no, but when I think about it my daughter’s day-to-day life is surrounded by opportunity communicate, effectively. My husband and I avoided ‘’baby talk’’ from the very beginning. We didn’t have silly names for things, ever. If we were giving her a glass of water or a bottle we wouldn’t call it ‘’wa wa’’ or ‘’ba ba’’ instead. Traditional ‘’baby talk’’ has always seemed unnatural to me, so this wasn’t exactly something I deliberately didn’t do but after being around friends with other young children I realised how different my day-to-day language was with our daughter, it was more ‘’grown up’’ somehow. Though I don’t think it’s necessarily a bad thing if you want to communicate in easier tones for your child to understand, I do think expecting them to suddenly stop using these words at a certain age is then unfair. I can’t stress this enough. You can never read too much to your kid, it’s just that simple. We read all sorts of different books to encourage the diversity. Everything from simple picture books that are fun to longer books, that, I think, encourages focus. It’s the simple picture books (with busy pages) that we have the most fun with though. When she’s really young they’re fun pictures where we can point out all the different things on the page and as gets older I can ask everything from ‘’count the balloons’’ to ‘’who is closer to the boat?’’ to ‘’where’s the octagon?’’ type of questions. We also like flash cards. If our daughter mispronounces something, we correct her. Not in a military drill type of way but we will usually say ‘’I think you mean this’’, just once. After a few times (or correcting her) she’s usually got the proper pronunciation down. We do allow our daughter to watch a little TV and movies but we’re very selective about what she watches. We follow her lead as to if she’s into a show or not but if we as parents don’t like it we won’t allow it. There are a lot of really dumb programs for children. Ones that speak in dumb languages and words. The first red flag for us as parents is the clarity of speech. Something I started doing with her when she was young was count the stairs as we walked up. We also sing songs like ABC’s when we’re driving in the car to keep her distracted from an otherwise boring car ride. From these things alone she has been counting and singing her ABC’s for many months now. I am by no means and expert of any kind, these are just a few things that we’ve done that seem to have led to a pretty decent vocabulary and pronunciation for our two-year-old. 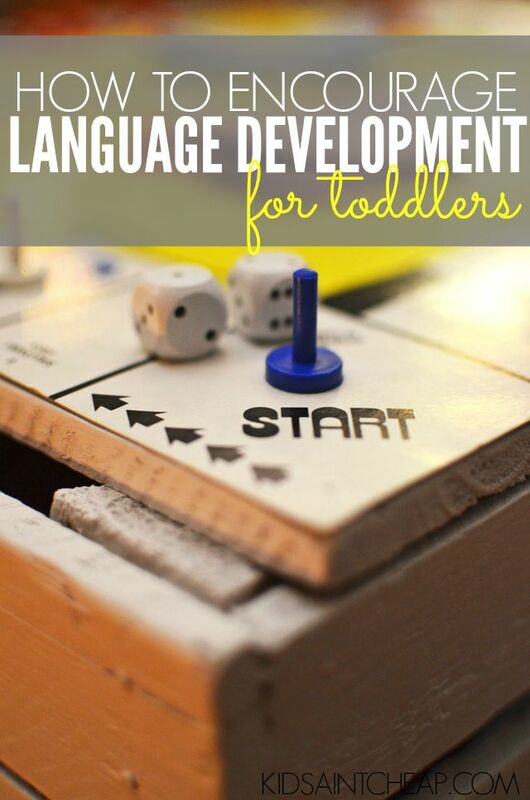 Do you have any tips for encouraging good language development for toddlers?